Brandon Plumbing and Heating and will have his papers as a licensed plumber in the spring of 2000. Kristen Leah was born September 25, 1980. After a year spent in Australia, she is now attending Brandon University. Brian Broornhall, son of Lillie and Edward, was born November 20, 1948, in Brandon. He was married to Mavis Bercier on November 25, 1967. Mavis was born in Brandon. They were divorced in 1970. They had two chil­ dren, a set of twins, Timothy Joseph and Cheryl Lee, born May 10, 1968. Timothy married Royalynn Breen of Brandon on July 15, 1989. Royalynn was born Febrnary 15, 1964. Timothy is employed with the Provincial Government (Brandon Mental Health Centre). They have three chil­ dren. Zane Mitchell was born March 17, 1991. Jamie-Lee Carol was born December 31, 1992. Trevor Michael was born January 19, 1998. Cheryl Lee, twin daughter of Brian and Mavis Broornhall, is not married. She is presently living III Nanaimo, BC. Brian Broornhall later married Carol Fleetham of Calgary on May 19, 1973. She was born May 30, 1952. They live in Calgary where Brian is employed with the Calgary School Board as an electrician. He took his elec­ trician's course at A.C.c. in Brandon. They have two daughters. Brandie Lynn was born September 15, 1978. She is employed with a pet grooming shop in Calgary. Leanne Elizabeth was born July II, 1980 and will complete her high school in 2000. Barry Irwin Broomhall, son of Lillie and Edward Broomhall, was born January 25, 1952. He was married to Anne Hylynski of Brandon on September 30, 1978. They were divorced and had no children. He later married Jacquelyn Madigan (Bjarnason) on August 10, 1988. Jacquelyn was born April 9, 1951. Jacquelyn has three children. Patricia was born October 16, 1969 and has one daughter, Victoria, born October 17, 1987. Rachel was born July 3, 1972, and Eric was born January 12, 1979. Patricia and Rachel live in Winnipeg and Eric lives in Calgary. Barry and Jacquelyn live in Winnipeg and have no children. Barry has been employed with Farm Income Tax Company and Jacquelyn is employed with Canada Safeway. Emma (Nyquist) Fardoe was born in September 1923. She married Russel Fardoe on May 23, 1953. Russ was born October 4, 1929. They have two children. Ronald Brian was born Febrnary 22, 1959, and Ronaele Elizabeth Fardoe was born July 25, 1962. She is employed at the Fairview Home in Brandon. Government and Russel worked for the John Deere and Mazer Implement Companies as partsman. They retired in 1989 and spend their summers trav­ elling with their camping RV trailer from one provincial park to another. They have camped throughout Alberta and Saskatchewan but now spend their summers III Manitoba where there are many beautiful parks. They leave Brandon in May and do not return until the end of September. Time marches onward and with it the inevitable changes that occur in life. The descendants of Charlie and Elvina Oman have experienced the sorrow of deaths, the joy of marriages and births, and the pleasure of many memorable get-togethers. The families have remained close and have always shown care and concern for each other. Five of the eight children are still living. In 1985, Mabel Hillstrand moved from Hilltop into the Parkland Home in Erickson where she still resides. She very much enjoys living there and the many friends she has made over the past fifteen years. Mabel has contin­ ued to live independently and remains interested in her church and community. 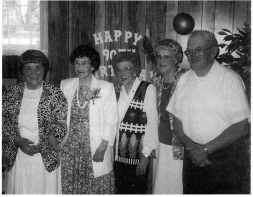 In 1999, she celebrated her 95th birthday and was able to help in the planning of her party at the Parkland Home. Mabel's older daughter, Florence Wetteland, of Mission, BC, passed away April 17, 1996 at the age of69. Her husband, Stanford, still resides in Mission, as does his son, Kevin, and family. Her younger daughter Mavis and her husband, Wilson Johnston, and Mistoffelees (the cat) reside in Brandon. Wilson retired from painting in Shilo in 1990 and Mavis retired from teaching in Brandon in 1993.